Fun shirts to wear with jeans or shorts are easy to make from men’s T-shirts or undershirts. These shirts come in a variety of colors and when trimmed, are inexpensive fashion-right tops. You can purchase a package of three men’s undershirts for much less than the price of one woman’s top or blouse. 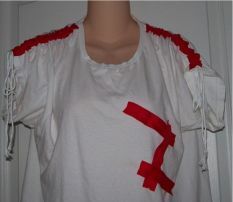 There are many ways you can decorate and trim these undershirts, and today I’ll give you a couple of examples. 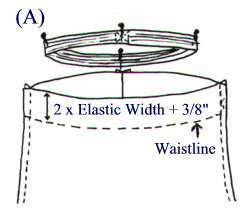 For a blouson style you will need an undershirt one or two sizes larger than you would normally buy, 3 yards of cording and one yard wide double fold bias tape. Before beginning, open up the wide double fold bias tape and press it flat. Pin the bias tape over the shoulder seams from the neck down the middle of the sleeves, turning the tape under 1/4″ at each end. Stitch each side of the bias tape and down the center (by pressing the double fold bias tape, there will still be the slight center mark that makes sewing down the center very easy). Cut 4 cords the measurement of the tape casing plus 2″. Insert the cords in the casings and tack the cords at the neck edge. Make a knot at the cord ends. Pull the cording to form shirring at the shoulder and tie the cording in a bow. Determine the length of the blouson, or leave the undershirt the length it is. Make two machine button holes 1/2 inch on either side of the center front at the hemline. 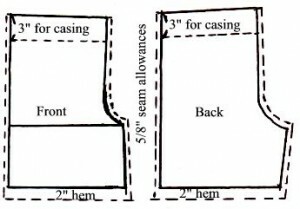 For the casing, press up 1″ and stitch. Run cording through the bottom casing, knot the ends and tie the cord in a bow. You can add additional decorations, appliques, etc to the front of the t-shirt as you desire. To make a decorator tank top from a man’s t-shirt, use a t-shirt in the size you normally wear and one package of rick rack, in your choice of color. 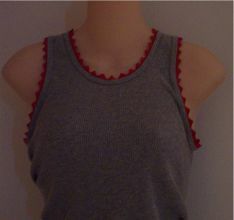 Pin and stitch the rick rack around the neckline and armholes of the t-shirt, and you’ll have a tank top that’s ready to wear. With school starting soon, all of us in the sewing business will be bombarded with requests to try to make some pants and shorts for those customers who have overweight and plus size children because there just won’t be anything in ready-to-wear that will fit them. This year why not try out the following shorts tutorial, learn how to make shorts/slacks according to those overweight childrens’ personal measurements, then post a flyer in all the fabric stores in your area announcing your new service —- you will be sewing day and night to keep up with the requests, and after making the first few patterns, you’ll be able to make them with your eyes shut!! It is very important to take the measurements accurately because those measurements will be used as the basis for additional styles and variations. You should be measured standing in a natural position and the crotch taken while sitting in a straight hard-back chair (not in a cushion type chair). 1. WAIST: Tie a piece of elastic around the narrowest part of your torso and measure the waist at that spot. 2. HIP: The hipline is normally 8″ below the waist. Measure loosely around the thickest part and add 3/8″ to the measurement. 3. 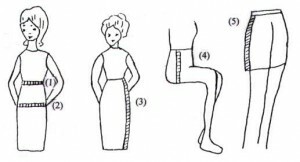 COULOTTE LENGTH: Measure from the waist to the desired length of the split skirt / coulotte length. 4. CROTCH: Measure the crotch sitting down. Take the measurement on the side from the waist to the chair, and add 1 1/4″. 5. SHORTS LENGTH: Place your arm along the side of your leg. Measure from the waist to the point on your leg that the middle finger touches. This is your basic shorts length, however the length will vary, according to the style you’re making. Each child will have different measurements, depending on their age and how overweight they are. I recommend that you get some manilla envelopes to store each child’s pattern after you’re finished with it, including their name, actual customer’s name and their phone number — the customer WILL be back for you to make more of them!! STEP BY STEP INSTRUCTIONS are set up to be followed in a manner similar to the “dot to dot” pictures – connect all the dots as instructed, and you’ll have the completed shorts pattern. 1. Draw a vertical line to equal the desired length of the shorts plus 3″ for the elastic casing, our example being 23″. Measuring from the top, make a mark along the vertical line to equal the crotch measurement +3″ (3″ is for the elastic casing), our example being 13″. Draw a horizontal line at the top of the vertical line to equal H/4 = 10 1/2″. 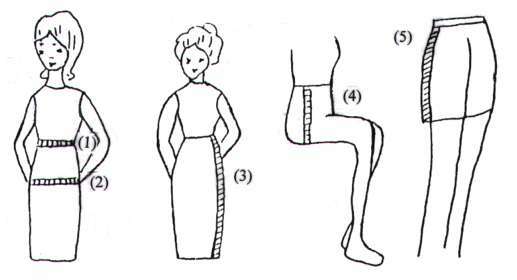 Draw a second horizontal line at the lower crotch measurement point to equal H/4 = 10 1/2″. Complete the “box” as shown. 2. 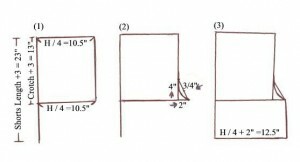 Beginning at the lower right hand corner of the box, measure out 2″, as shown. From the same lower corner, measure up 4″. Draw a diagonal line to connect the two marks just made. Divide the diagonal line in half and measure in 3/4″, and draw in the curving front crotch line, as shown. 3. 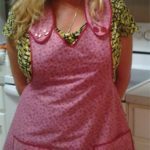 To complete the front shorts pattern, draw a horizontal line from the bottom of the length line to equal H/4 + 2″ (12 1/2″). Next connect the end of the line just drawn to the outside edge of the crotch line previously drawn, which will complete the front shorts leg pattern. 1. Draw around the front shorts pattern, as shown with dashed lines. 2. Beginning at the outside edge of the waistline, measure in 3/4″ and up 1/2″. Draw a straight line connecting the in 3/4″ and up 1/2″ marks to the crotch line curve that’s on the front pattern. 3. At the outside edge of the crotch curve, measure out 1 1/4″ and down 1/4″. This mark becomes the crotch extension for the back. Draw in the curving line to connect the new crotch extension mark up to the crotch curve along the front pattern. The last step is to draw in the new “inside” leg line – drawing from the new crotch extension point to the bottom of the leg. 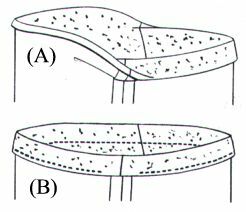 As with all pattern making, there have not been any seam allowances added until the pattern is finished. Draw in the 5/8″ seam allowances as shown with dashed lines, and make a 2″ hem at the bottom of the shorts. 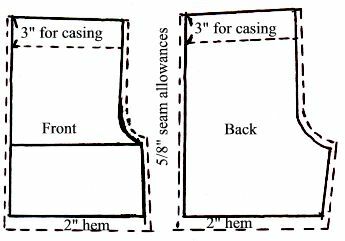 NOTE: 3″ has already been added to the pattern during the drawing process to allow for the elastic casing, so there is no need for any other seam allowance along the waistline. 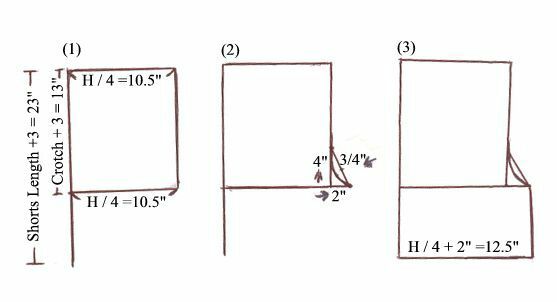 44″ wide material requires 2 shorts lengths plus 10″ (3″ elastic casing on each and 2″ hem on each) – or better yet, measure the finished pattern AFTER drawing in the hem, etc and use that as your actual length. 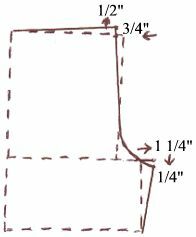 54″ wide material requires 1 desired shorts length plus 5″ (3″ elastic casing and 2″ hem) – or better yet, measure the finished pattern AFTER drawing in the hem and use that as your actual length. Draw in a “straight grain” line in the center of the shorts that is parallel to the side. Lay the pattern on the fabric as indicated. If the pattern is small enough and the fabric wide enough, both pieces can be placed side by side on the folded fabric. Pin and sew the front crotch seam (A), and then the back crotch seam. Next place the front and back pant sections right sides together. Pin and sew the outside leg seams, sewing from the top to the hem edge (B). 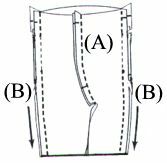 Stitch the inside leg seams (C) sewing from the crotch to the lower hem edge on each leg. don’t sew up one side and down the other as this may cause the shorts to hang incorrectly. To make the elastic casing, finish the upper edge of the shorts by zig zagging or using a serger stitch. Fold under 1/4″ and press (A). Fold the casing 1″ as shown. Pin in place, then stitch, leaving about 2″ not sewn at one side seam (B). This is where you will insert the elastic. Cut the elastic the desired length. Attach a safety pin at one end of the elastic (C). Work the pin / elastic through the casing beginning at the unsewn area. Work the elastic all the way through the casing, making sure to keep the other end outside the casing (it may be a good idea to pin the loose end to the fabric so it won’t accidentally slip through the casing). 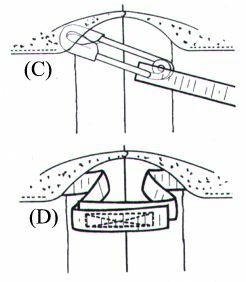 After threading the elastic through the casing, overlap the elastic ends (D) and machine stitch the ends securely. Evenly space the elastic, then finally, stitch the previous “unsewn” area. The final step is to sew the hems in the legs. Fold under 1/2″ and press. Fold under another 1/2″ and pin in place, then sew the hems. 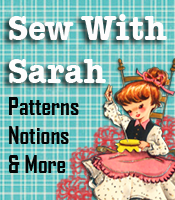 For a variety of shorts / slacks / coulottes patterns that you could also offer to your customers, see the entire shorts/slacks pattern making class at SewWithSarah.com. The classes here are for men, women and children. 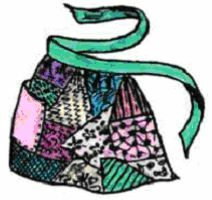 In addition to the pattern making classes, we also have a variety of patterns for Plus Size Children under the category of Sewing Patterns. 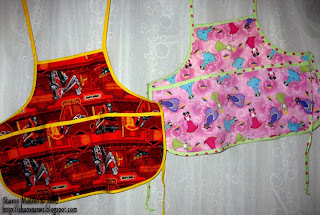 Start early and make perfect fitting garments for the plus size and overweight children you know or may sew for.